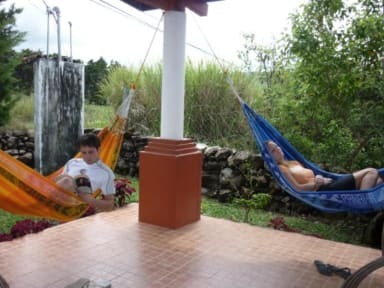 The property is located 10 minutes outside of town in a tranquil neighborhood and there is a beautiful garden with orange trees, pineapple plants and comfortable places to hang out like hammocks and easy chairs. Everything is very new and nice looking. It is the perfect place to stay for a while and totally feel at home! There is an office with a person 6 days per week to schedule all kind of fun adventures for you so you can see and learn a lot about the surroundings. The property is part of the Spanish by the River Language School and is situated 5 km outside the town center in Alto Boquete. It is easy getting into town for only 50 cents with communal taxis and buses frequently passing by on the main road, just 180 meters from the school. Best Hostel I had in Panama. ricardo is really friendly and organizes trips and cooking together. Really good place to chat with other people and get in contact. Thanks a lot!!! I stayed here for Christmas and it was the best decision. First thought was „oh that’s far outside“ but to get to the town is very easy. Just 60 Cents by bus or taxi - 10 minutes. Supermarket nearby. Nice big garden with fresh oranges and chickens which spend eggs. I can really recommend if you want to have a nice time. Tours beginning in town are also no problem. Very small, familiar and cozy Hotel to relax. The location is pretty close to the main road, so you get into town and other destinations quickly. Staff is friendly, welcoming and hospitable. We even had a Taco night organized by staff with all other guests. Every morning we could collect eggs and fruits from the garden. There is also a very friendly dog. Beds were comfortable and rooms mostly standard. We had a wonderfull stay Art Spanish by the River. Charlie, the owner, gave us all the Informations we Needed for our stay in Boquete. He also recomended us a very good coffee Tour. The rooms are clean, and just have Two beds. So it is Not really a dorm. The Kitchen and bathroom was also clean. All day free coffee! The only which could be better is the WiFi. Thanks man! Sehr kleines Hostel mit nur 4 Zimmern mit insgesamt 8 Plätzen. Im großen Garten mit Hühnern, Hund und Zitronenbaum stehen bei Bedarf noch Zelte bereit. Ricardo, der Manager ist ein Schatz, belebt das Hostel mit seinen Ideen und ist immer ansprechbar. Wenn viele Leute da sind, ist es sehr eng, da Boquete abends kühl ist und alle rein gehen, hier ist allerdings zu wenig community space. Ist etwa eine Stunde zu laufen in den Ort, Bus ist aber preiswert. Küche ist gut und Supermarkt ist nah.